Do ‘Dwarf’ trees really stay small? The American Heritage College Dictionary defines “Dwarf” as “an atypically small animal or plant”. “Dwarf” Japanese maples and “dwarf” weeping cherries (or other weeping trees) are extremely popular among homeowners, who seek out trees five or six feet tall and wide, small enough for a foundation planting. It’s common to see such trees planted mere feet from the corners of homes. Landscape “professionals” make this mistake constantly, often at the urging of their customers. Homeowners become frustrated when these trees continue to grow, sometimes reaching 20 feet wide and tall, unless they are constantly cut back. They’ve all seen perfectly-sized “dwarf” trees in their neighbor’s gardens. The question is, how do you tell a naturally “dwarf” tree from a tree that’s small simply because it’s still young and hasn’t finished growing? Many examples of overgrown “dwarf” trees are simply removed once they get too big for the space. The search for “dwarf” trees often leads to big-box stores and mail-order catalogs, where there aren’t pesky nurserymen asking silly questions like “how big do you want this tree to be when it grows up?” Years later when the tree outgrows the space, the source where it was purchased is usually forgotten. A phrase we hear often is “well, they told me it was a dwarf” (but then it later grew much too large). In other words, someone who wasn’t knowledgeable or perhaps even misled the customer sold them the wrong plant. Many plants are labeled with their typical height and spread. This can be very misleading if these plants are typically sheared or cut back in landscapes, and the label assumes you’re going to do the same. Left alone, Taxus yews grow twelve to fifteen feet; “miniature” pussywillows can get twenty feet tall, and a single Forsythia bush can colonize your entire yard. You’d never see that on the label. Certain species of trees do grow more slowly and to a smaller mature size than others. If we were to plant a three-foot weeping Japanese maple “Tamukeyama” or “Crimson Queen” today we’d probably be dead by the time it grew to 20 feet across, or perhaps where we planted it the growing conditions might be so poor that it would be naturally stunted. If we neglect to water or fertilize it or protect its delicate new branches from the late frost, it might die back or stop growing just from stress. By planting a small tree and constantly replacing it each time it got uncomfortably large, we could enjoy the dwarf tree of our desires indefinitely. That’s why there are so many tiny Japanese weeping maples to be found in landscapes and so few large ones. The same goes for weeping cherries: when the trunk reaches six inches in diameter and it’s blocking the sidewalk the homeowner simply cuts it down and starts over. There is hope. There are in fact many species of trees that are “atypically small” in the landscape, and some of them are maples (NONE are weeping cherries!) Still more are tree cultivars you’ve probably never heard of, but if you saw a mature example in the right setting you’d probably want one for yourself. The very first step in choosing one is to figure out how wide and how high you want the tree to be, years from now when it’s full grown. Armed with that information and an open mind, you can go to a good nursery and choose from many interesting and beautiful trees. Steve Boehme is a landscape designer/installer specializing in landscape “makeovers”. 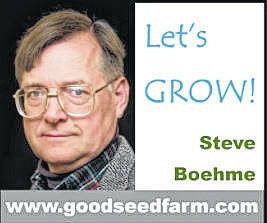 “Let’s Grow” is published weekly; column archives are on the “Garden Advice” page at www.goodseedfarm.com. For more information is available at www.goodseedfarm.com or call GoodSeed Farm Landscapes at (937) 587-7021.